Download "Credit Card Overview & Processing Guide entrée Version 3"
1 Credit Card Overview & Processing Guide entrée Version NECS, Inc. All Rights Reserved. 5 V3 Credit Card Overview Configuring entrée V3 for Credit Cards Required Security Management Updates Before you can configure credit card processing in entrée you must update the security permissions for the System Administrator and the user name who will be editing credit card data and the credit card gateway settings. Once this security update is completed that user can configure credit card processing for the system. 1. To update security settings for the System Administrator (or designated User name) use menu path: System > Security Management. 2. Select the User name of the person who requires the security access. Usually the System Administrator user will be performing the edits for credit card processing. Whomever is configuring credit card processing will need these permission changes for their user name account. 3. Then click the Edit button at the top to make changes to the security setting. 6 4 entrée V3 Credit Card Processing Guide The Properties dialog will open in the General tab for the user. 4. Click the Setting button. 5. Now click the + plus sign next to Miscellaneous system options to expand the options list. 6. Scroll down the options list and check these two options: # 31 Allow editing of stored credit card data # 55 Allow editing of credit card payment gateway settings. 7. Click OK. 8. Then click Exit to close the Security Management dialog box. Now proceed to the next page for information about Configuring System Options. 7 V3 Credit Card Overview 5 Configuring System Options To configure credit card processing in entrée go to the System Preferences dialog System Options tab. 1. First you must check system option #144 'Enable Credit Card Processing Support' and click OK. 2. Now go back into the System Preferences to the System Options tab and go to the Additional Features section. 3. Tap the drop down menu and select the 'CC Processing Config' option (the option will only be visible if system option #144 has been enabled). 4. Click the Configure button below Additional Features and the 'CC Configuration' dialog will open. Proceed to the CC Configuration Overview section on the next page for configuration settings and instructions. 8 6 entrée V3 Credit Card Processing Guide CC Configuration Overview When you click the Configure button the 'CC Configuration' dialog will open and display the 'Authorize.NET Gateway Settings'. 1. Fill in the information as described in the chart below. 2. Click Save when all the information has been entered. 3. It will return you to the System Options tab where you will click OK. 4. Next proceed to the Storing Customer Credit Cards chapter that follows. API Login ID API Transaction Key The API login ID and transaction key are issued by Authorize.NET and may be retrieved by logging into your merchant account through the Authorize.NET website at: Once logged into the Authorize.NET website click on the 'API Login ID and Transaction Key' link located under the 'Security Settings' heading of the 'Account' section. Enable Test Mode This flag puts the credit card processing system into test mode. While in test mode entrée will appear to process transactions normally but they will not be saved by the Authorize.NET gateway for settlement. Some operations may behave unexpectedly when operating in test mode. For example all transaction id's and auth codes returned from Authorize.NET will be '0'. 10 8 2 entrée V3 Credit Card Processing Guide Storing Customer Credit Cards Customer File Maintenance Credit Card Management The heart of entrée's credit card processor is stored credit card information. Credit card data must be stored on file for your customers. The credit card data is encrypted on disk, and once entered into the system, is never displayed in its entirety again not to anyone, at any point. The numbers are displayed using an industry-standard mask such as: 41**********1111 Managing stored credit card data is quite simple. Once the credit card processor has been activated, a new tab in the Customer File Maintenance screen appears, labeled 'Credit Cards'. If the user's password options allows access to editing of the stored credit card data, this screen will allow the addition, editing, deletion, and testing of a stored credit card. Otherwise, this screen is read-only. The customer's default card is displayed in blue, and any stored credit cards, which have expired, are displayed in red. 11 Storing Customer Credit Cards Adding / Editing Credit Cards To setup a new stored credit card, first click the "Add Card" button. The stored credit card data window will appear. The card description can be any name that will easily distinguish this card. All values on this form are required. If more than one credit card is assigned to a customer checking off 'Default card for this customer' will tell entrée which card to use when creating invoices for customers with payment terms set to CREDIT CARD. For more information please see: Accepting Credit Card Payments. This information is used for the transaction authorization process when attempting to perform a funds capture or refund. Please ensure this information accurately reflects the cardholder's billing information. 2.2 Removing Credit Cards To remove a customers card select the card to remove from the list and click on the 'Delete' button. The stored credit card manager allows cards to be removed if they are not linked to any transactions. If a card is linked to any transactions, an error dialog will appear saying "Cannot delete "card name" This card is still linked to transactions, which must be purged before it can be deleted". Credit card transactions must remain in the system for the lifetime of an invoice so as to provide accurate history and refund ability. Credit card transactions are moved into history when the 'Close Period' utility is ran and purged from the system when the purge 'year-to-date' utility is ran. 2.3 Testing Credit Cards In some cases, it may be desirable to test a card prior to putting it into service. To accommodate this, the 'Test Card' button may be clicked on the desired card. This will authorize $1.00 on the card, then void the transaction. The result of the test authorization will be presented in the credit card processing dialog. 13 Accepting Credit Card Payments 3 11 Accepting Credit Card Payments entrée's integrated credit card processor allows for credit card payments to be processed automatically at invoice print time or manually through Enter Cash Receipts using the button. Credit card payments may only be processed for the balance of an invoice. In order to accept partial payment of an invoice by credit card a cash or check payment must first be applied to the invoice. The credit card system gives special meaning to a payment terms value of CREDIT CARD. For further details please see Accepting Payments - Invoicing and Accepting Payments - Cash Receipts. 15 Accepting Credit Card Payments Invoicing entrée may be setup to process credit card payments when an invoice is printed. There are two ways this may be enabled: 1. Automatically charge credit cards for a customers invoices by defining a credit card for the customer then setting their payment terms to CREDIT CARD. This will tell entrée to attempt to charge the card for any invoice created for this customer. If a customer has multiple credit cards defined you may select which card to use by setting it as the 'default' card. See Storing Customer Credit Cards - Adding / Editing 2. 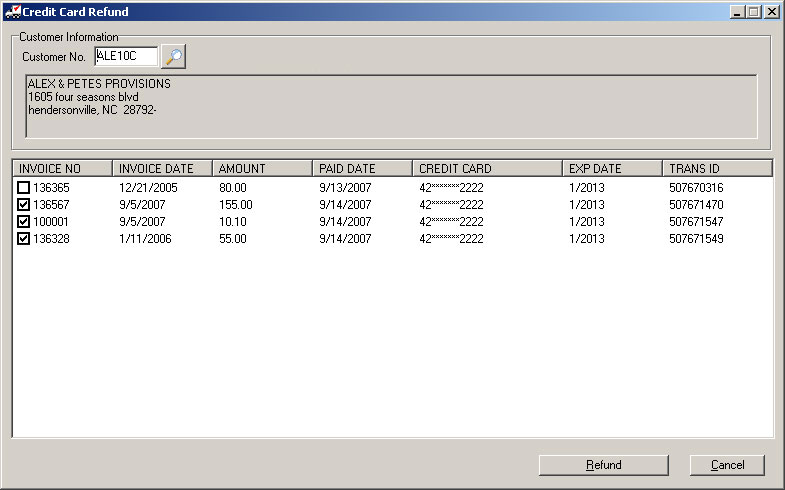 Assigning a credit card to an invoice through the 'Billing Detail' dialog. Click the button from the Billing details screen of the Create / Change Invoice screen. The stored credit card manager will appear. 3. From there simply click OK after selecting the desired card. The invoice payment terms will automatically change to CREDIT CARD. 4. Click OK again, and the selected card will be assigned to the invoice. In both cases the credit card will not be processed until the invoice is printed. 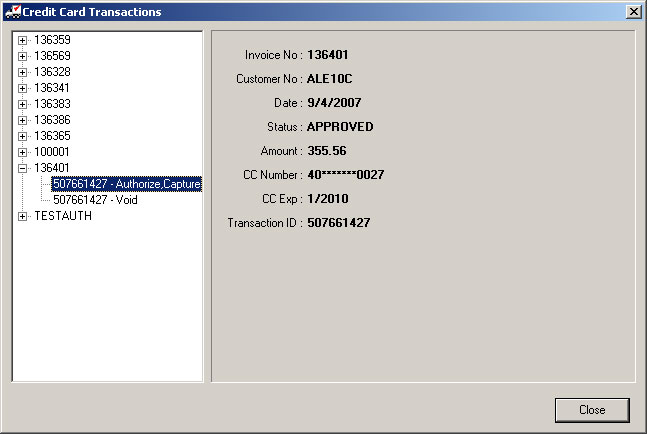 During the invoice print process a credit card processing window will be displayed listing the results of all transactions for any invoices set to use CREDIT CARD payment terms. When credit card payments are applied during the invoice print process they are assigned a new batch number however this batch number will be used for all transactions processed during the print process. 16 entrée V3 Credit Card Processing Guide Cash Receipts After credit card processing is activated, a button is displayed in the "Receipt Information" area of the Enter Cash Receipts screen. Credit card transactions must be performed before any cash or checks have been entered and may not be performed when entering multiple receipts. 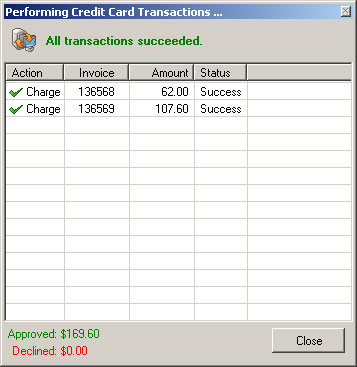 Clicking the button will cause the Credit Card Invoice payment screen to be displayed. The list will be loaded with all unpaid invoices, showing the invoice number, original invoice date, the invoice total, and the outstanding balance. Simply check the box next to the invoice to be paid with the selected credit card, and click OK, to process the checked invoices transactions. Use the Select All button or check off one or more invoices for payment in the credit card payment screen in Cash Receipts to process payments for multiple invoices in a single credit card transaction. 17 Accepting Credit Card Payments 15 You can edit the Amt to Pay against the selected invoice (as long as it's not more than the open balance). Any credit card charge which is used to pay multiple invoices cannot be refunded in part. You can partially refund a credit card charge that was used to pay a single invoice but a charge that was used to pay two or more invoices can only be refunded in full. 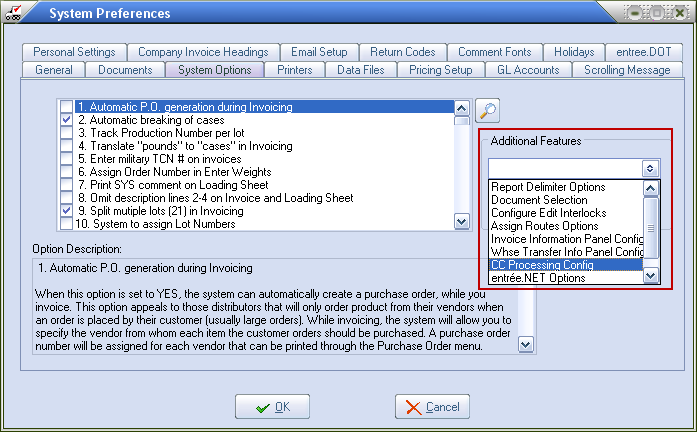 Check numbers are assigned to each paid invoice, beginning with a "C" and ending with transaction number returned from the Authorize.NET server. Credit card transactions processed through this manner will use the 'Batch Number' assigned on the main Cash Receipts window. 19 Refunds 4 17 Refunds Refunds may be issued for invoices originally paid either in full, or partially by credit card. 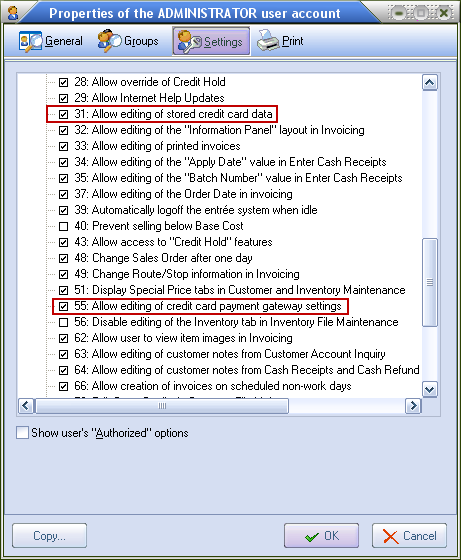 After a customer is selected, all invoices paid by credit card will be displayed. Simply check the box next to the invoice to refund, and the credit card transaction will be reversed if the transaction is successful. Please note that transactions paid with a stored credit card that is currently expired cannot be refunded. After each checked invoice is processed, a detailed summary of any failed transactions will be displayed. Performing Partial Refunds A new dialog will appear after selecting the invoices to refund which will allow a "refund amount" to be specified for each invoice. Refunds may only be applied to settled transactions. 21 Transaction History 5 19 Transaction History The credit card transaction history is available for review. This screen will break out the transactions by invoice number. Expanding the desired invoice in the tree view will display all of the transactions associated with the selected invoice. This information can be used in determining problems with any transaction, and is not useful on a day-to-day basis. Credit card transactions must remain in the system for the lifetime of an invoice so as to provide accurate history and refund ability. Credit card transactions are moved into history when the 'Close Period' utility is ran and purged from the system when the purge 'year-to-date' utility is ran. 23 Reporting 6 21 Reporting The Cash Receipts and Deposit Slips reports have options which all for separating and grouping credit card payments. The 'Display' option controls what types of payments are included on the report. This may be one of: All Only Cash/Check Only Credit Card The 'Transaction Type' column in the Layout tab in the reports system may be used to group the payment types together. 24 NECS, Inc. All Rights Reserved. (a) You can click on the Payment link in the Welcome page Snapshot as displayed in Figure 2 below. TABLE OF CONTENTS. ipay / Magento Implementation Guide 2 Copyright 2012 Planet Payment, Inc. All Rights Reserved.